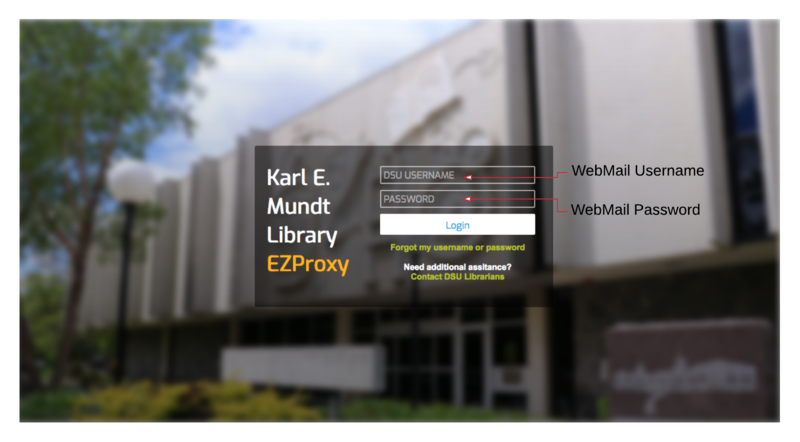 When you are off-campus and link to a library resource, you will be asked to enter your DSU Username and Password. When? This will happen when you access databases or when you link to an online item within the Library Catalog from off the DSU campus. Username: The DSU Username is the same shortened version of your first and last name that you use to login into WebMail. Password: This is the password that you use for your WebMail account. NOTICE: Do not use the username/password that you use to login to D2L or WebAdvisor - these are different credentials.